"The ability to develop and supply more technical talent to Charleston's tech industry is essential for the growth of this industry here," said Charleston Digital Corridor Foundation Director, Ernest Andrade. The Lowcountry’s knowledge economy is growing so rapidly that the demand for highly skilled professional and technical workers is outpacing the existing recruiting efforts by Charleston regional companies to supply them. Currently, high tech jobs share 4.7 percent of the job market and that number is predicted to skyrocket in the coming years, bringing over 8,000 jobs to the Charleston area. To help meet the need for skilled professionals, Google has provided a $10,000 sponsorship to The Charleston Digital Corridor Foundation’s (CDC) CODEcamp. CODEcamp is a community-sourced training program that provides instruction in open source Web and mobile technologies. Funds are designed to serve Berkeley County residents to develop the skills needed to advance in Charleston’s growing high-tech industries. The sponsorship will also provide no-cost space at the Flagship, the Charleston Digital Corridor’s co-working space, for a Berkeley County entrepreneur. Since 2009, Google, which has a data center in Berkeley County, has awarded more than $1 million to South Carolina nonprofits in fields of science and technology education. Google employees also participate in Digital Corridor events and serve on the board. By awarding dollars to educational initiatives like CODEcamp, Google hopes to grow the pool of technically skilled professionals in the Palmetto State. 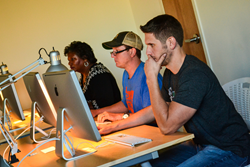 CODEcamp expands the Lowcountry’s technical workforce by providing individuals with access to affordable training in Web and mobile technologies, mentors and networking. Classes are offered on a part-time, evening basis and are designed for hands-on learning as well as practical applications and are taught by industry professionals from the Digital Corridor community of companies. Thanks to this sponsorship, CODEcamp scholarships are now available to Berkeley County residents, even if they are not enrolled in school. Contact the Charleston Digital Corridor’s Program Manager, Carolyn Finch at Carolyn(at)CharlestonDigitalCorridor(dot)com for more information.